For the next three days we will be considering Wisdom’s Possession (vv. 22 – 23); Wisdom’s Primacy (vv. 24 – 26); and Wisdom’s Presence (vv. 27 – 31). 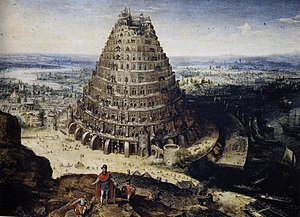 This week I’ve been studying that wonderful Old Testament passage of Genesis 11:1 – 9, the story of the Tower of Babel. You recall that in that post-diluvian era, men settled on the Plain of Shinar and pooled their resources toward the building of a city and a tower to reach to the heavens, that they would make a name for themselves and not be scattered over the face of the earth. You might also recall the detail that “they had brick for stone, and they had asphalt for mortar” (Genesis 11:3). One scholar suggested an interpretation about Genesis 11:3 that I have never come across before. He pointed out that Moses was writing to that generation of Israel which had been held in slavery in Egypt–forced labor in Pharaoh’s massive building projects. The great temples and pyramids of Egypt were built principally of granite and limestone, hardy building material which has indeed stood the test of time. This scholar was suggesting that Moses was in fact encouraging Israel to scoff and jeer at the builders on the Plain of Shinar. The many masons of Israel certainly knew that brick and tar were a poor substitute for precision-cut limestone and granite! The proud architects of the Tower of Babel were entirely out of their depth from the outset of their project. They knew what they wanted to build, but had no realistic idea of how to accomplish their task. How gloriously different is the wisdom of the Living God! Before the LORD began his wonderful work of Creation, He possessed wisdom. He knew what He wanted to accomplish, and He knew how He would go about the task. Solomon is teaching us that wisdom is an eternal virtue, a quality written deeply into the character of God from before the dawn of time. The wisdom which He possesses, He freely shares with us when we ask for it (James 1:5). Grant us wisdom, dear God, the wisdom which is from above—peaceable, gentle, willing to yield, full of mercy and good fruits, without partiality and without hypocrisy (James 3:17). Through Christ our Lord, Amen. This entry was posted on Sunday, July 20th, 2014 at 6:30 am	and tagged with Book of Proverbs, Egypt, Old Testament, Pharaoh, Shinar, Tower of Babel and posted in Creation, Wisdom. You can follow any responses to this entry through the RSS 2.0 feed.